Virtual gastrointestinal endoscopy trainers are often used as part of surgical residency-simulation training. The GI mentor has been shown to have construct and face validity with different level of learners in prospective cohort studies. It is unclear whether with prior exposure to these devices PGY1 and PGY2 residents become more adapt to these trainers thereby challenging the paradigm of construct validity. 1. Can colonoscopy training on GI mentor maintain stastically significant construct validity among the fellows, faculty and residents? 2. Can the validity be challenged in a retrospective study where prior exposure could play a role in certain areas of the performance? This is a retrospective study comparing faculties and fellows to PGY1, PGY2 residents. The PGY1 and PGY2 had previous exposure to the device and the faculty and fellows were novices. Their performance during basic colonoscopy training utilizing the GI mentor was taken for analysis. Time to reach caecum, percentage of excessive local pressure, lost view of lumen, % of the mucosal surface examined, % of time spent with clear view, % of time patient was in pain, efficiency of screening [%], were taken for analysis and they are grouped into PGY1, PGY2 and faculty-fellows as group III. Using Chi square test, P value of <0.05 was considered significant. There were a total of 72, 56, 56 basic colonoscopies completed by PGY1, PGY2 and group III. 38% and 49% of the colonoscopies performed by PGY1 and PGY2 respectively were within 7 minutes which was stastically significant when compared to 16% by group III [P <0.003]. 33%, 36% and 43% of colonoscopies by PGY1, PGY2 and group III have taken more than 12 minutes to complete. In causing excessive pressure during the procedure PGY2 performed the best. They caused significantly less (38%) mild pressure compared to PGY1 and group III (68%). [p<0.02]. The results were comparable for causing moderate and severe pressure. Group III examined more than 90% of the mucosal surface in 40% of the procedures compared to 25% and 13% by PGY1and PGY2 (p<0.05). Of note, less than 75% of the mucosal surface was examined during 60 % of the procedure performed by group III whereby only 25% of PGY1 and 13% of PGY2 examined less than 75% of the mucosal surface as well. Faculty were able to maintain a clear view during a significantly higher percentage of procedures ,[more than 90% clear view] but group III also had less than 75% clear view in 50% of the procedures which was comparable across all groups. All other performance measurements were stastically not significant. 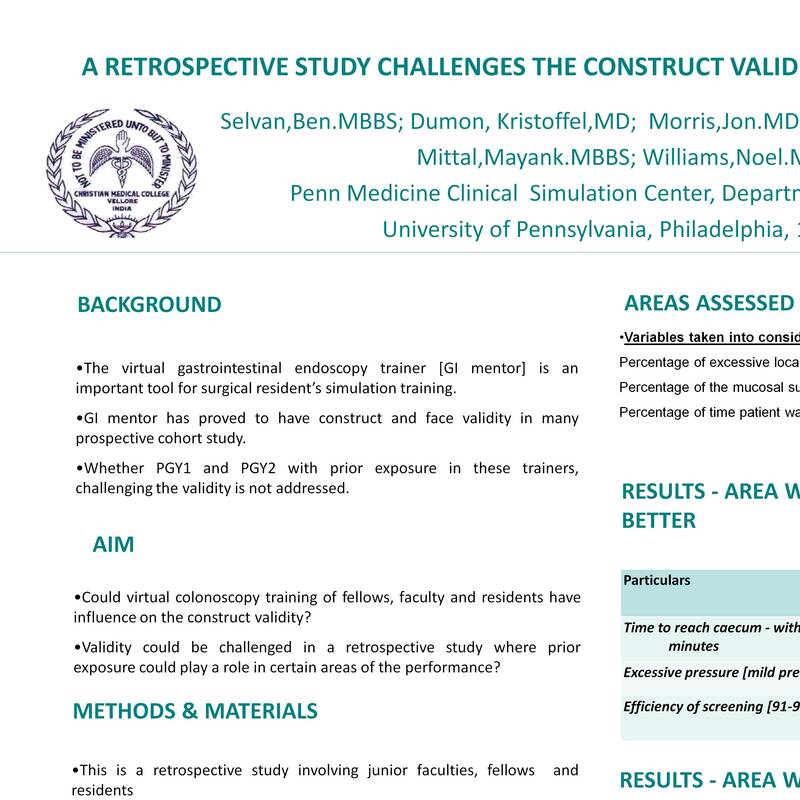 Though the faculty performed significantly better in an area which is maintaining clear view during the GI mentor colonoscopic training, other areas such as time to complete and exerted pressure during the colonoscopy were inferior to PGY2 thereby challenging the construct validity especially in a retrospective study.